Verdesativa Ayurvedic Auromere Toothpaste is ideal for the daily care, contains 24 natural extracts of flowers and medicinal plants with antiseptic, antibacterial and protective properties. 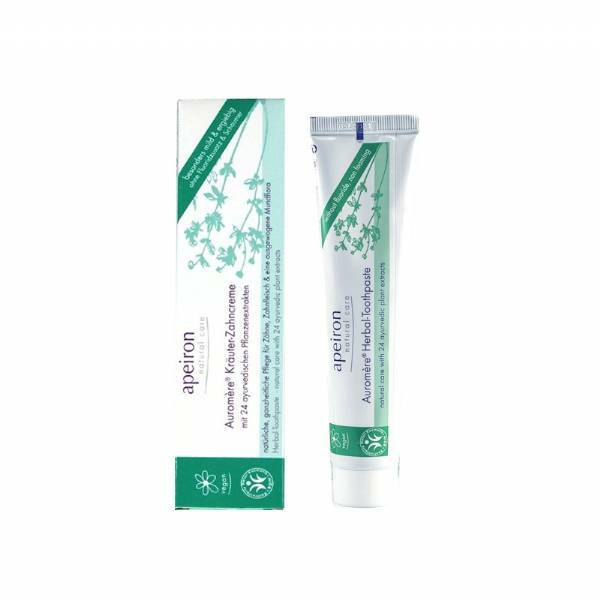 Contains 24 natural extracts of flowers and medicinal plants with antiseptic, antibacterial and protective properties. Verdesativa Ayurvedic Auromere Toothpaste is ideal for the daily care, which strengthens the gum and fights the onset of bacterial plaque. A 100% natural and amazing product, from Sri Lanka, no foaming substances, without fluoride, or other risky ingredients. Ingredients (INCI): calcium carbonate, aqua, glycerin, glycirrhiza glabra, sorbitol, melia azadirachta, persad salvadora, punica granatum, zizyphus jujuba, syzygium jambolana, eugenia caryophyllus, juglans regia, prionitis prunus, prunus amygdalus, Zanthoxylum americanum, zanthoxylum alatum, caesalpinia sappans, rubia cordifolia, acacia catechu, smilax aristolochiaefolia, cinnamomum zeylanicum, mimosops elangi, anacyclus pyrethrum, carum copticum, geranium, thymus vulgaris, silicea, mentha piperita, mentha viridis, eucalyptus globulus, pimpinella anisum, , chondruscrispus.